[Michigan, September 20, 2014]: The American Human Rights Council (AHRC) joins the world community in celebrating the International Day of Peace that falls on September 21 of every year. AHRC hopes that this year’s anniversary would serve to advance peace and greater understanding among people across the globe. AHRC hopes that this occasion this year will help to dispel the language of war, terror, extremism and build a world free from radicalization, torture, abuse and injustices; a world where human rights and human dignity are protected and preserved for all regardless of race, gender, faith or national origin. 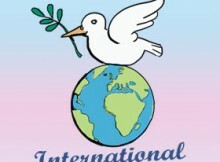 The International Day of Peace was recognized and adopted by the United Nations resolution 36/37 on 1981. The nations of the world united to declare this day a day to advance the ideals of peace among all nations across the globe. In addition, the United Nations adopted resolution 55/88 considering September 21 as an annual day of non- violence and no war. This year’s anniversary of September 21 – the International Day of Peace is celebrated despite huge challenges facing our nation as well several countries experiencing the absence of peace where the language of war and conflict and division resulting in hundreds of thousands of deaths, injuries, destruction and displacement. The ongoing crises in Syria, Iraq, Lebanon, Egypt and Gaza-Palestine indicate that there is still much work to be done to make world peace a reality. The cycle of violence and counter violence deprive innocent people and children in particular the dream of peace and the pursuit of freedom and happiness that all people deserve. One major challenge facing the world and the Middle East region nowadays is the growing and rapid threat of Islamic State (IS), formerly known as ISIS, and what the terror group represents. AHRC calls upon peace- loving people at home and abroad to live up to the true meaning of peace and to work diligently to make peace a reality. We all have the equal right to Peace. AHRC, along with sister organizations in human rights advocacy, with the support of our friends and donors, work to make a world of peace built on the foundation of respect for human rights a reality. Together, we can build a peaceful world free of hate, torture and injustice, a world that respects the human rights of all. “ Peace is a basic human right for all and is a net gain for all. War is our common enemy” said Imad Hamad, AHRC Acting Director. “ The atrocities of WWI and WWII made many people realize the importance of working for world peace. Unfortunately, many conflicts have erupted since then and so many people are deprived of the right to live in peace across the globe especially in the Middle East region,” noted Imad Hamad.